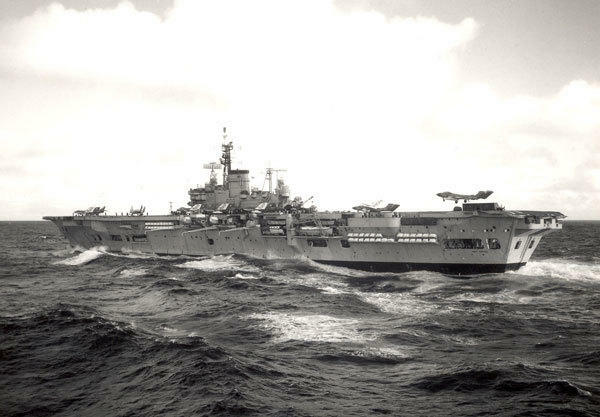 The fourth ship to have held the name of Ark Royal.One of the four Audacious class carriers laid down during WW2 and a sister ship to HMS EAGLE. Laid down 3rd May 1943 and launched 3rd May 1950 after many delays. A complete redesign to include an angled flight deck of 5.5° and uprated catapults delayed her commissioning until 25th February 1955. She had 4.5" guns and a deck edge lift port side. In 1956 the port 4.5" guns were removed and in 1960 the deck edge lift was removed. In June 1960 she was operating Sea Vixens of 892 Sqn off the North African Coast. A major refit 1967/1970 transformed her with an 8.5° angled deck, new catapults and arrester gear and new Island. A new electronics package was fitted. The remaining 4.5" guns were removed. Fitted for but not with Seacat missiles for defence she left refit with no defensive armament. She operated Sea Vixens until the 1967 refit and then operated the Phantom F4K until 1978 when she was decommisioned in December of that year. Her sister ship HMS Eagle provided spares during this period. HMS ARK ROYAL was towed to the breakers yard in Scotland in 1980. This was the end of conventional catapult and arrester gear fixed wing aircraft operation aboard Royal Naval aircraft carriers. HMS Ark Royal operating Sea Vixens of 890 Sqn. archive of Lt. (O) Bill Hart. RN.